In our Adventure Pack (which is our name for my backpack) we carry all the things that any daring explorer would need on his or her adventure. There are pens and keys. A pirate bandanna. We have plastic forks and knives that we've been given at take-out places (often when packing for the day we -I- forget utensils!). We have a tiny first aid kit - consisting of Sting Stop, a few band-aids, a small bottle of aspirin, and maybe one or two other things. There's change for emergency candies (like yesterday), a lighter, extra britches for Maddie (though not necessary anymore, really -but you never know). Paper towels with a water/alcohol/essential oil concoction that Mama makes to wash and sanitize hands, often an Audobon Society book or two, our Hiker's Plant Press, and always, of course - magnifying glasses. The last things with a permanent pocket are art supplies, and Claire Walker Leslie's Keeping a Nature Journal. Usually I have a big sketch pad in there, too. This morning when I was thinking about it, and thought of not having my sketch pad with me yesterday, I remembered an idea I had. 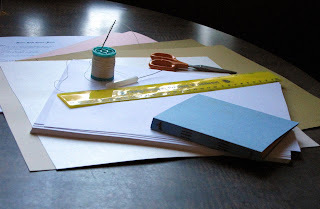 Several months ago I attended a library program with a couple of friends - a book-binding class. My finished project is five inches tall, by four and-a-quarter inches wide. It has 80 pages. It's a tiny tiny little thing - with a heavy, card-stock cover. It weighs hardly anything at all, and I'd say the idea is just about perfect for first Nature Journals. Or for writing notes to one's self. Or for coloring in while lying on the grass while ones feet sway back and forth in the air. So, today I've chosen the covers. and picked up some white paper that I think will do just fine for the pages. And into the Adventure Pack will go chicken salad sandwiches, carrots, and book making supplies. My goodness. New camera, a day at the the park with friends, and something lovely to create while sitting chatting with two of my favorite Mama's.